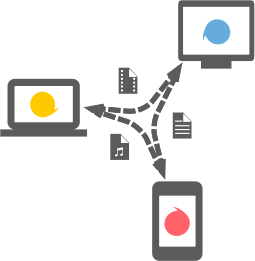 Sid combines encrypted group messaging and file transfer. Communicate in your team more secure and more efficient than via email. Send large files faster thanks to a direct connection between the devices and our intelligent network detection. Get it for all platforms! Send files of any kind and size the fastest possible way. Ready in seconds - no admin needed. 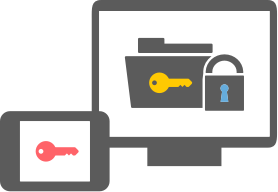 Your files are stored locally and always accessible, even offline. Everything is kept in sync. Through our encryption technology and our specially developed end-to-end encrypted transfer protocol, each sent message or file is protected against unauthorized insight. Since Sid works without a telephone number adjustment, only you decide with whom you are communicating with and who knows your Sid address. Sid fulfills the criteria of the European and German data protection laws and stores all cached messages and files end-to-end encrypted on German servers. Set up your team easily and start right away with secure messaging and file transfer. Sid is ready for use within a few seconds. Use it for private and team communication. Team contacts are exchanged with every new team member automatically. Sid is using a decentralized peer-to-peer technology to transfer data without uploading to a server or cloud. Your data is routed the fastest possible way without taking detours and will use the local network if applicable. 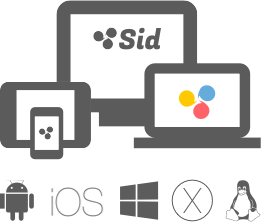 Sid clients are available for desktop computers, notebooks, tablets and as native apps for iPhone and Android. You can use it on any operating system like your computer in the office or on your smartphone anywhere else.